For anyone who’s ever read a handful of stories on this site, you’ve likely figured out that we like music that makes us want to go into the forest immediately and take in the environment. A few weekends ago, a bunch of us went into the Monongahela National Forest (no Duck Newton sighting, sadly) for a weekend to be amid the trees and waterfalls in order to unwind from the things that haunt us every day. The only mistake was having no fitting music in my ears. A band that definitely would have made for an ideal soundtrack is Arête, a group made up of members of other noted artists such as Twilight Fauna, Slaves BC, Deafest, and Evergreen Refuge—Paul Ravenwood (guitars, vocals, flute, percussion), Dylan Rupe (guitar, bass, percussion, vocals), Chase (guitar, piano, vocals), and Josh Thieler (drums). Their style of black metal instantly conjures feelings and thoughts of the outdoors, especially around now when the trees look utterly amazing. Weird to say in November, but hey, nothing to worry about environmentally! 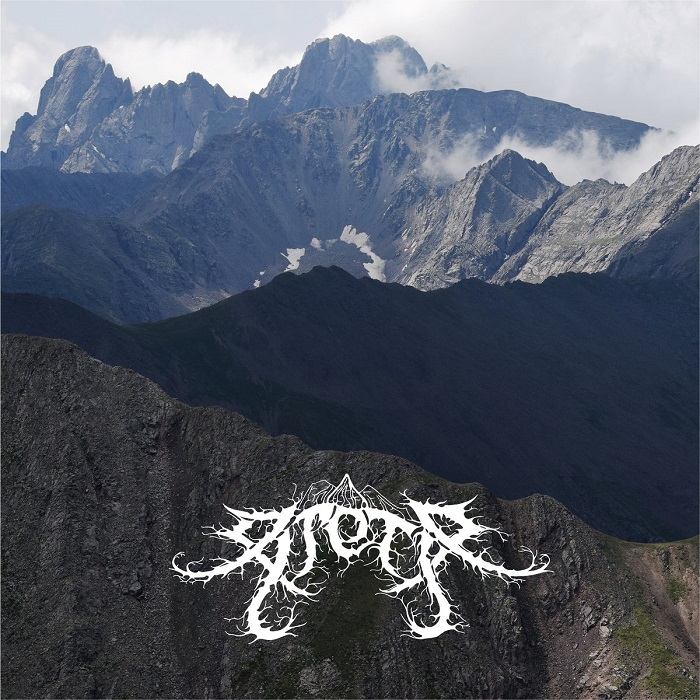 Anyway, crunching over sticks and leaves, working your way through the damp forest, these six cuts arrive is an ideal time, just when temperatures are going to begin to dip in much of the United States, when black metal sounds its very best. This is a rich, rewarding experience, a record that’ll be in rotation here regularly for the next several months as we await the ice and snow. “Breathe the Pond” starts, fittingly, with water trickling, setting serenity, while whistles call in the distance, and a synth bed arrives. The drums then awaken, while the growls erupt almost in whisper-like fashion, sneaking beneath the chaos. Sorrowful melodies lap before the song erupts, with a gazey sheen glowing before calm returns, bringing with it acoustic guitars and a plucked banjo, bringing a last gasp of rustic air before a burst that flows to the finish. “A Plague From the Green Tongue” has guitars bursting and growls heating up, as a scathing path is blazed, with the track toggling between power and woodsy serenity. Of course, the calm times never last long, as the beast tears through the other side, going off and crushing what’s in front of it, eventually melting into the icy streams deep in the forest. Out of that emerges a doomy riff, as the band lets loose a final gust of thrashing, with infernal growls leading them off into the night. “Hymnal” is a quick acoustic cut that is led by acoustic picking and atmospheric energy that cools the air in front of you. “Edifice” has icy keys dropping before growls slither and the track comes to full life. The fiery passages still find their way into frigid zones, with the track finally reaching the shore from the land, as guitar waves lap over top. Then the power returns, as riffs catapult and swirl in the air, letting off gasps of glory before dissolving into acoustics and coming to rest amid elegant folk tones and warbled speaking. “You Hear Me” is delicate at the start, building its way toward the metallic eruption, as growls hiss and the pace storms. Riffs slice though as the fires build, heading into head-swimming ambiance before the guitars rekindle their fury. The leads sting, while a huge deluge of emotion knocks you over, devastating and quaking the earth before we’re back into the bubbling stream, washing out into the heart of the woods. “Of Endings” is an instrumental closer that is immersed in murk and steely acoustics, with a lonely whistle calling, and winter seemingly waking from its slumber. Records and bands that conjure certain feelings about seasons always are welcome around here, and whether or not they intended to do this, Arête nail the late autumn/early winter vibe on “Hymnals.” It has that chilled, forestal air that shocks your face when first walking outdoors and also fills your lungs with a sensation that locks your chest but doesn’t freeze it in place. Now that the nights arrive sooner and the sun consistently changes late afternoon skies into burnt oranges and purples, this record should be an excellent companion for paying tribute to those parts of nature no one can ever kill.